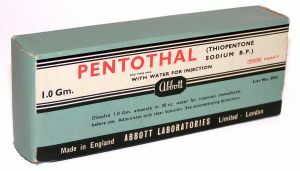 Hospira – currently the only registered marketer and supplier of Sodium Thiopentone in Australia – stopped making its version, “Pentothal“, at its US plant because of an unspecified raw material supply problem. When Hospira attempted to move production of Pentothal to a factory in Italy, authorities there demanded guarantees from Hospira that any Pentothal produced would not end up in the hands of executioners for the purposes of capital punishment. (Approximately 35 states in the US use Thiopentone as a component of the drugs used to carry out death row executions). The implication was that if Hospira was unable to control Italian-made Pentothal to the ultimate end-user, the drug company would be held liable for any use of the drug in capital-punishment cases. Hospira provides these products because they improve or save lives and markets them solely for use as indicated on the product labeling. As such, we do not support the use of any of our products in capital punishment procedures. Kees Groenhout, clinical research and development vice president. Given the issues surrounding the product, including the government’s requirements and challenges bringing the drug back to market, Hospira has decided to exit the market. We regret that issues outside of our control forced Hospira’s decision to exit the market, and that our many hospital customers who use the drug for its well-established medical benefits will not be able to obtain the product from Hospira. leaving Australia with no currently registered supplier of Thiopentone. Here’s hoping that prisons in the US don’t start using Propofol for lethal injections any time soon.